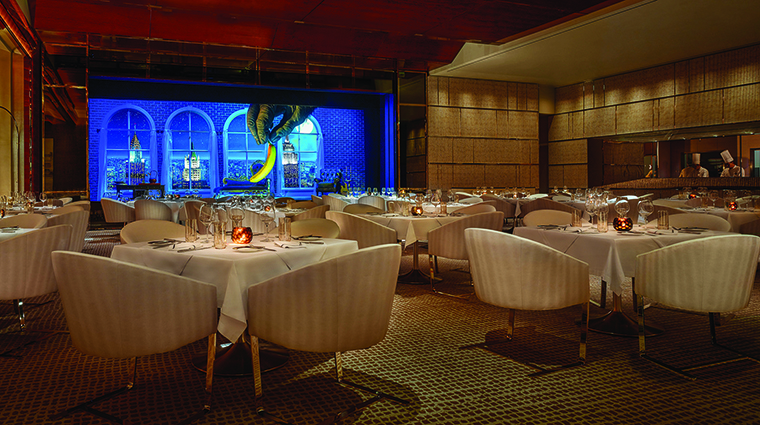 Another Vegas-to-Macau import, the elegant SW Steakhouse brings quality meat and seafood along with a side of unorthodox cabaret to Wynn Palace. In terms of design, SW Steakhouse is somewhat neutral thanks to the soft color palette and the clean design, but chrome and etimoe wood add elements to make it feel suitably masculine. The cabaret at this mecca for meat lovers is certainly of the less traditional variety, but it is no less entertaining. A series of six 3-D shows of between two and three minutes that blend computer animation, puppetry and animatronics starts every 30 minutes. SW Steakhouse arguably has the most interesting dinner entertainment in Macau, thanks to its 3D cabaret show. You don’t want to miss it. Expect a good range of the best-quality steak around, from Japanese wagyu to USDA prime Nebraska beef to Australian black angus. If you don’t feel like beef, try the lobster. A live lobster cart rolls up to your table and you can pick your own catch for dinner. SW's bar claims to offer Macau’s finest collection of brown spirits as well as some of America’s most reputable and rarest whiskies, including Pappy Van Winkle. There is also a selection of American oak barrel-aged cocktails that are made in house. While meat is the start of the meal, don’t overlook mouthwatering sides like the smoked mac and cheese and the black-truffle-laden creamed corn. While the menu is extensive, there may well be occasions when certain cuts are not available or when special ones that normally aren’t menu are featured. Be sure to ask your server if there is anything new available (or missing) on the day of your visit. Getting to SW Steakhouse is a breeze if you take a complimentary Wynn Palace shuttle. Shuttles run seven days a week from 10 locations across Macau, including Macau International Airport and both ferry terminals. As with practically every other Macau restaurant — both high-end and modest — Chinese New Year and Mid-Autumn festival visits make reservations an absolute necessity. SW Steakhouse is open for dinner daily but is closed on Tuesdays. While located in the appetizer section of the menu, the delicious SW Seafood Spectacular, which includes lobster, crab, shrimp, clams and oysters, should fill anyone less than ravenous. As far as the provenance of the beef goes, it doesn’t get much better than this. Entire cows are purchased from accredited independent Japanese Wagyu farmers before each cut is aged individually. If a dry-aged porterhouse from Glen Innes or a Nebraskan New York strip isn’t indulgent enough, a menu of additions offers half lobster tails, Alaskan crab Thermidor or seared foie gras. Designed by Todd-Avery Lenahan of TAL Studio, whose work can be found in dozens of countries, subtlety is achieved in the dining room through shades of cream and coffee. It doesn’t divert attention from the food or the cabaret. Props/scenic designer Michael Curry’s decades-long career, that has seen him work with Disney, Cirque du Soleil and the Metropolitan Opera, was brought to bear on the cabaret at SW Steakhouse. For his show at the Macau steakhouse, Curry was adamant that diners not feel compelled to give performers their undivided attention. The six clever 3D shows, which include two giant playing cards singing the Richard Burton and Julie Andrews duet “What Do the Simple Folk Do?” from the musical Camelot, are very much in the mold of musical theater. Be sure to look up during your visit to see the hundreds of glass teardrops that are suspended over the private dining rooms and raised seating areas. The arches created by the gentle illuminations are pleasing to the eye.